Hop on over to the Mercer County Courthouse lawn for an Easter Egg Hunt! There’s a prize in every egg – some even contain prize-winning slips for gifts that are too large to fit in an egg! Everyone is welcome! Help us spread the word by going to our Facebook event page and inviting your friends to the event. Adventure Awaits! 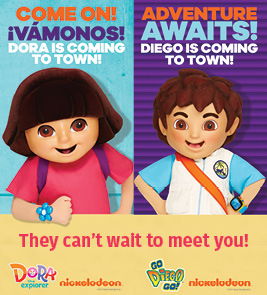 This year, Dora and Diego are coming to town for the Easter Egg Hunt. They can’t wait to meet everyone! We’re so egg-cited to see you! After the event, we’ll post photos to our Facebook page. And, feel free to tag Wabash Mutual Telephone in your photos on Facebook. We’d love to see them!